The biggest hostel in Toruń located in the nineteenth-century renovated building. Its character is inspired by the railway station surroundings and the travel. Last complete renovation in 2015. The rating of Hostel Przystanek Toruń is 9.3 from the maximum 10, 36 based on actual and valid guest ratings and reviews. "Bardzo miła obsługa, super wystrój wnętrz, przede wszystkim czysto." "Słaba wentylacja w pokoju, przejeżdżające pociągi tuż za oknem." 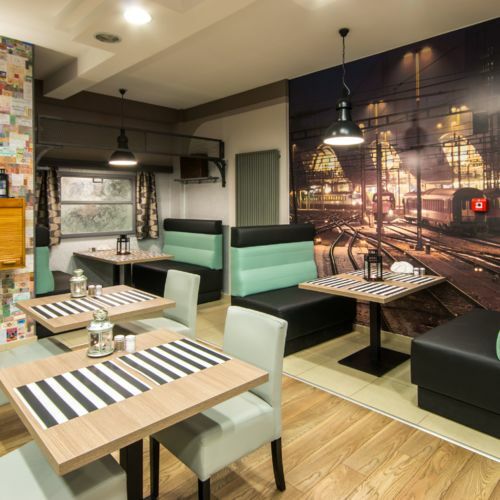 "Blisko do centrum, parking w cenie, łatwy dojazd"
Based on the reviews and comments of actual guests, the services of the Hostel Przystanek Toruń have received a high rating of 9.4/10.